After seven and a half years, the state siting board has finally put the last nail in the TGE coffin. The board voted today to deny TGE's application to build an 1,100 megawatt power plant at the Bushwick Inlet. The ruling is significant in that it allows to City to move forward with acquiring the property (formerly the Bayside Fuel Oil site) and turning it into public parkland. For a neighborhood that ranks near the bottom in terms of open space per capita (and with our capita growing much faster than our open space), this is a momentous decision indeed. Congratulations and thanks are in order for everyone who fought this project - in particular Assemblyman Joe Lentol, GWAPP, NBA and OSA and all the volunteers who trekked to Albany and fought this project every step of the way. 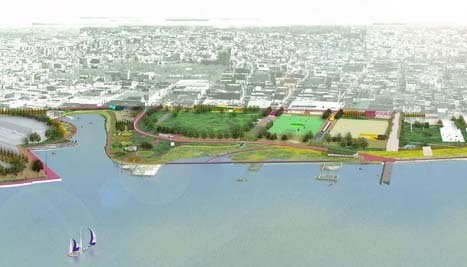 With any luck, we will soon have green open space, ball fields and maybe even a waterfront concert venue on the Bushwick Inlet. 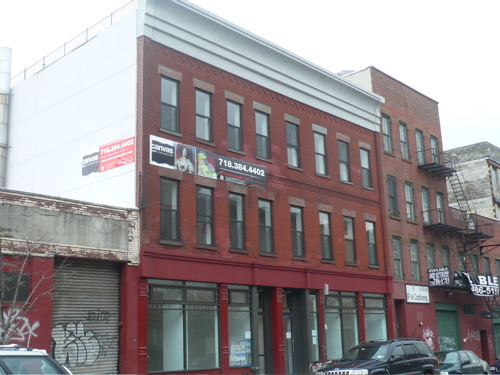 UPDATE: The Brooklyn Daily Eagle has an article up on the victory, including details on the siting board's findings. 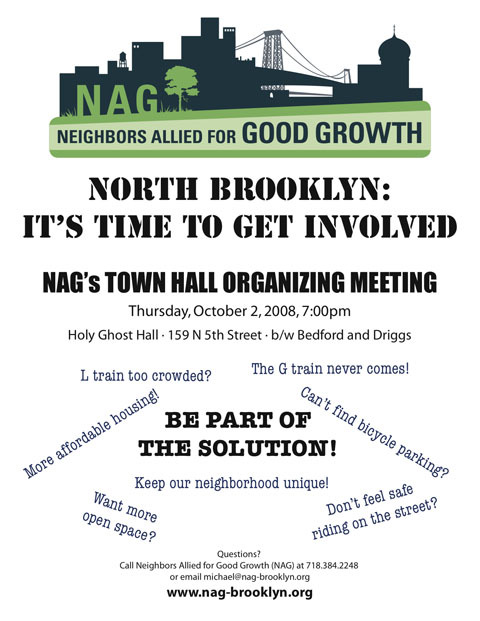 โบนัส 100 % กีฬาNAG (Neighbors Allied for Good Growth), a community organizing group in Williamsburg and Greenpoint, is having a Town Hall Meeting on 10/2 to mobilize the community on issues facing Greenpoint & Williamsburg. Longtimers will remember NAG as one of the leading voices against waste transfer stations on the waterfront, against Radiac, and for intelligent rezoning that protects jobs and housing. As NAG looks to the future, it is holding this meeting to take the pulse of the community and to identify the issues the community will organize around in the coming years. 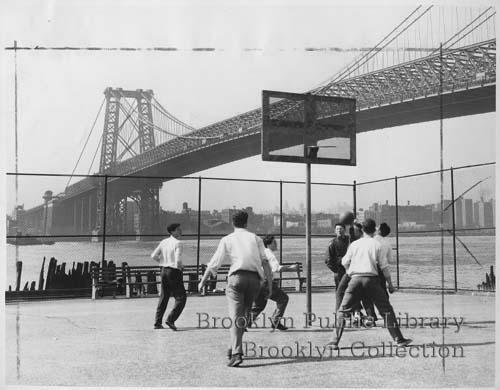 "Waterfront basketball--A spacious Park Department playground on Kent Ave. at the foot of Broadway provides ideal athletic facilities in the very shadow of Williamsburg Bridge." Effective Saturday, East River State Park is closed for the season. 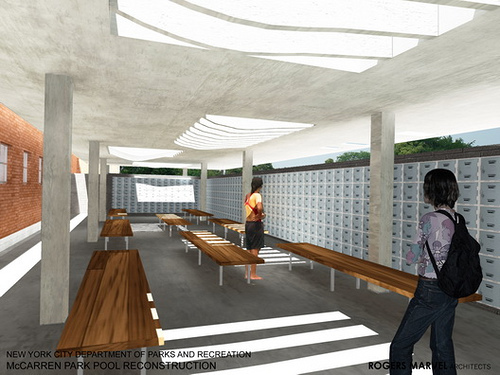 State Parks had been saying they were going to do it, but there was some hope that a deal might be reached to keep it open. We hear that both Friends of BEDT Park and Assemblyman Lentol are still working to reach a deal that would allow public access to the only significant waterfront open space in all of north Brooklyn. 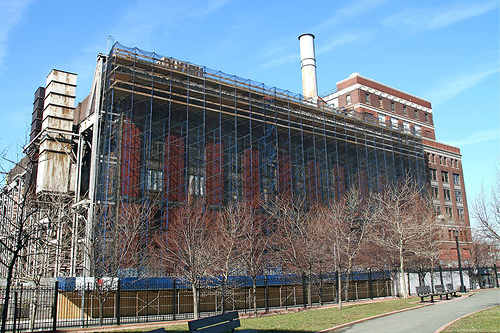 Meanwhile, all of the other state parks in NYC (including Fulton Ferry in Dumbo) remain open. 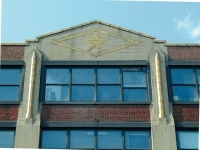 Coincidentally, we came across this picture while trolling the Brooklyn Public Library's website this evening. 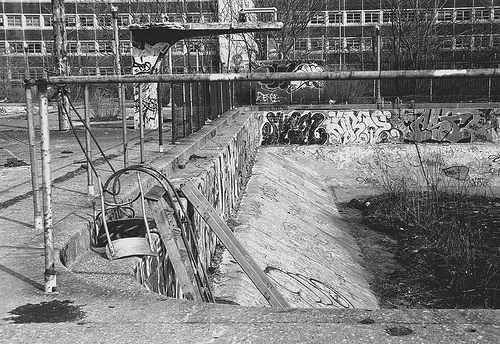 Taken in 1950, it shows a former NYC Department of Parks playground on Kent Avenue between Broadway and South Sixth Street. 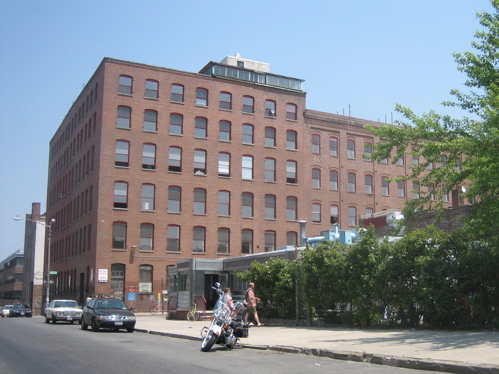 The site is now home to a city DOT facility. 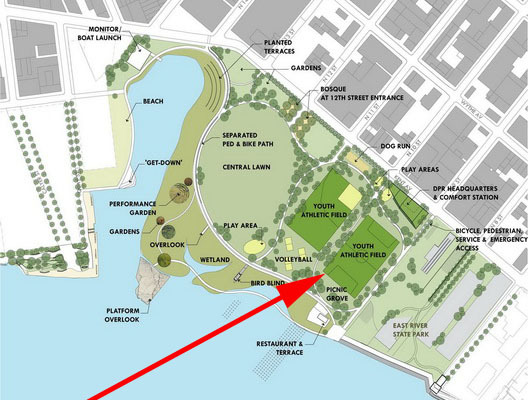 Even more coincidentally, this is the exact same location that OSA and others have proposed DOT turn over to Parks in order to create additional waterfront open space. If it ever came to pass, it would provide a nice terminus to the proposed Domino espanade.